COLOR(S):Blue merle, red merle, all red, tan speckles, black. The Australian Shepherd is an intelligent dog breed with strong herding and sheep guarding instincts that has also been known to perform well in search and rescue. These dogs are medium sized and athletic, as well as very loyal companions. 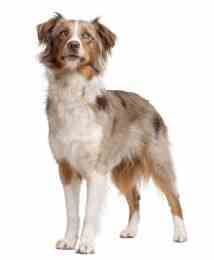 Australian Shepherds have longhair, a bobtail and striking, varied coat coloration. Their eyes are also noteworthy. With this breed, it is not uncommon to have a dog with one blue eye or an eye that is half blue and half brown. This coloring does not impair or affect their vision nor does it affect their standings when in the show ring. Their strength matches their unique looks and they are quick-footed and agile dogs. With stamina to work all day, the Australian Shepherd is a dependable and tireless worker. These devoted dogs enjoy pleasing their owners but are reserved with strangers. The Australian Shepherd makes an excellent companion to children and is eager to please with its sixth sense about what its owner wants. They are intelligent, clever and devoted dogs that love to play and seem like perpetual puppies. Great with active children, this breed is naturally protective, courageous, loyal and affectionate. Australian Shepherds enjoy being active, are easy to train and will make a devoted friend and guardian who is not aggressive. The double coat of the Australian Shepherd requires minimal grooming. The overcoat features a medium texture that can be straight to slightly wavy, is weather resistant and generally moderate in length. The quantity of undercoat will vary with the climate. Australian Shepherds are prone to several eye problems including Progressive Retinal Atrophy or PRA, juvenile cataracts and Collie eye anomaly. They can also be afflicted with hip dysplasia and deafness. To maintain good muscle tone, Australian Shepherds require daily exercise. They are a lively breed that enjoys being active. Getting ample amounts of various exercises will help prevent these dogs from becoming nervous or destructive. This breed also excels in herding, obedience and agility work. This intelligent dog breed does well with obedience training and takes to it naturally. It is recommended that Australian Shepherds receive this type of training.